And now, the thing to which I alluded in the title of last Wednesday’s post. § September 3rd, 2018 § Filed under death of superman Comments Off on And now, the thing to which I alluded in the title of last Wednesday’s post. 1. 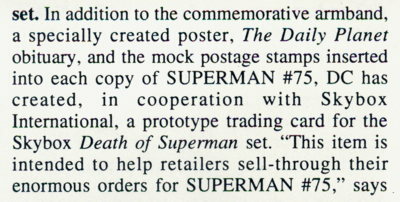 I can’t, for the life of me, recall if we sent away for that platinum edition of Superman #75 offered free to retailers in this article. If I had to guess, I’d say we…didn’t, somehow? Just in all the craziness it got overlooked and we never sent away for it? I can see that happening, but I can’t honestly remember. I’ll have to ask Ralph if he did send away for it and decided to keep it for himself. And if so, if I can talk him out of it and sell it in my shop. 2. I sort of got jumbled on the timing of this particular catalog initially, but it appears when this edition of Coming Comics was released, the actual release of Superman #75 had not yet happened. These solicits must have been put out just before Superman #75 came out on November 17th, originally solicited in the catalog for items with January cover dates…gee, I’m beginning to figure out why the timing of all this is confusing. Anyway, I like the idea noted here that they’re going to include a trading card in the bagged collectors edition that wasn’t mentioned in the original solicitation, which should “help retailers sell-through” all their copies of the comic. Woo boy, thank God that card was in there, otherwise we’d still be stuck with the darn things. (You see, friends, there was a time when superhero trading cards were hugely popular, and people actually sought out things like “chase cards” and “promos.” As opposed to today, when “superhero trading cards” usually means folks walking into comic shops trying to sell their sets of the first Marvel Universe series. Oh, it was a strange time. 3. That Legacy of Superman one-shot…I mean, it sold well, but we had plenty left over. The people buying “Death of Superman” weren’t necessarily coming back for the follow-ups. I mean, they stuck around for “Funeral for a Friend,” more or less, but the attrition was beginning. Perhaps that would explain the slight overstock folks had on the white-bagged Adventures of Superman #500, the beginning of the “Reign of the Supermen/Return of Superman” thing. JUST PERHAPS.